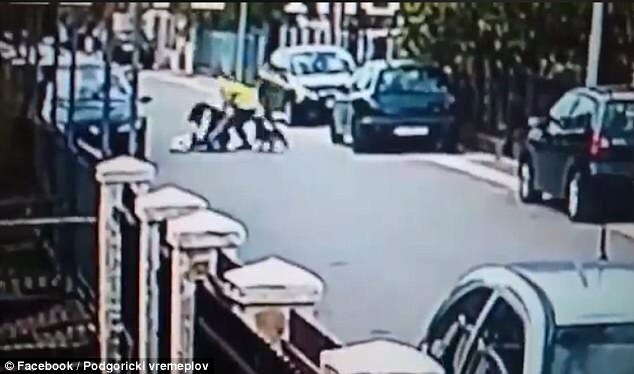 WATCH Heroic Stray Dog Springs Into Action To SAVE Woman From Being Attacked By Man – WINS! This is one of the reasons I love dogs. They instinctively go after bad guys like this one. No wonder they are called ‘man’s best friend’. In this case, they are a woman’s best friend. An uber viral video has surfaced that shows a woman walking down a street in Podgorica during the daytime. That’s the capital of Montenegro. A thug in a yellow hoodie is following her with very bad intentions. A heroic black dog can be seen in the street watching both of them go by. The thug attacked the woman from behind. She fell hard to the ground and he made a grab for her handbag. The brave dog wasn’t going to allow that to happen and sprang into action to stop the thief. He bit the man’s buttocks and legs. That was enough to make the attacker get up and run away as fast as he could. It wasn’t fast enough. This dog gave chase. He bites the guy some more and eventually turns back to check and see if the woman is okay. I’d take that dog home with me and given him a good home if I were her. Just sayin’. The video was posted on the Facebook group Podgoricki vremeplov. It’s a group for people living in Podgorica. That’s where it went viral and now has over 326,000 likes on Facebook and over 12 million views. This is your feel-good video of the year. I was shouting and cheering for the dog. It’s glorious. I love to see a thug get what is coming to him and this time, he got the hell bit out of him. The only thing better would have been if the woman was armed and sent this jerk straight to hell where he can be bit by demon dogs for an eternity. Works for me. Good dog! Members of the group were full of admiration for the dog, with many calling for it to get a medal for its bravery. Hell, give him a home and steak for life. This is why a dog is great not only for friendship, but security. They have nice teeth and great instincts. By the way, what kind of moron where’s a bright yellow hoodie and robs women in the middle of the street in the middle of the day? He should be arrested just for being an idiot. SMH. The dog is far smarter and a much better being than that asshat. Winning.